Rangefinder Cameras are a revelation to photographers who are starting to delve into more exotic kinds of gear. At first glance, to the developing photographer, rangefinders can look like toylike and less than worthy of your new found skillz. There are good reasons why rangefinders can look a bit ‘r Us. The viewfinder is a separate window that doesn’t go through the lens like an SLR. Isn’t that how cheap cameras compose the image? This is a good thing. A lot of the bulk of a SLR body comes from that nifty mirror tool that shows you what is happening through the lens. When you fire the shutter, the mirror flips up with a “slapping” sound, and the image is captured on the film / sensor behind. The shutter closes, and the mirror pops back down. 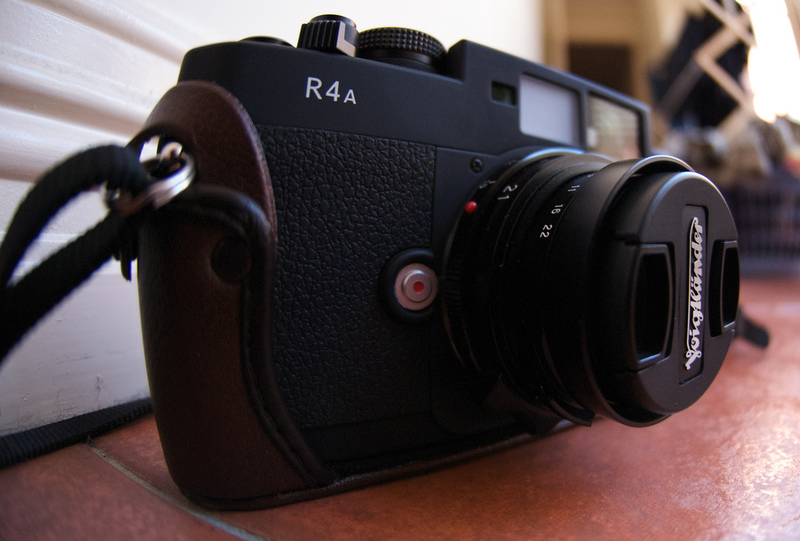 Voigtlander R4a – a great starter rangefinder. The composition window of a rangefinder is slightly offset. It does not ever “blackout” like an SLR – so you can always see what is happening. The windows are usually quite well suited to “two eyed” photography. You can often keep both eyes open, yet still focus and compose your image. Even in “one eye” mode, the RF viewfinder is usually bigger than the image space. The viewfinder will have lines marked to indicate the frame which will hit your film, called “framelines”. Most viewfinders are larger than the frame lines, so you can see what is about to come in and out of shot, whereas SLR viewfinders are pretty much shows ONLY the shot – no more no less. Some cameras automatically illuminate the correct set of framelines when you connect the lens. Some cameras have a dial you manually select the framelines with. Some just have multiple framelines in the viewfinder, and you have to remember which ones are the right ones for the lens you have on the body. Not having a noisy mirror slapping up and down in the body makes rangefinders almost silent to use. I was lucky enough to trial a Bessa 3 and was constantly wondering if the shutter had fired or not – it was that quiet and virtually vibration free. Rangefinders are very quiet, and the reduction in internal movements required to take a shot leads to sharper, shake-free, images. Rangefinders are particularly useful for street photography for this reason. Nobody is really sure if you have taken a shot or not, they are so damn quiet. The lack of internal mirror system also reduces both the size of the body, and the size of the lenses – which are tiny and light for the same quality as an SLR lens. Rangefinders just don’t need a big hunk of metal and glass to take high quality shots. As you are not looking through the lens, 99% of rangefinder lenses are primes. Just one focal length. Use your feet to zoom in and out. Being prime lenses, you can get some crazy apertures – F2, F1.4, even F0.9! I prefer prime lenses for all my cameras when out walking. I just hate fiddling with a zoom as I am trying to compose. Using prime lenses trains you to be a better photographer, I believe. Being smaller, they are less threatening than an SLR for subjects. They just look like an “Uncle Arthur” camera. With a smaller body, and very small lenses, rangefinders are light and mobile – perfectly suited for street photography. Got it? Great! The trick is to get us a straight plane or line in your viewfinder to focus – it is easy to see a “break” in a straight line in the focus spot and get an accurate result. It only takes a second or two to focus, depending on your dexterity, but it is no auto focus. There are no autofocus rangefinders (well there is one, but the debate rages on the interwebs if the autofocus Contax systems are true rangefinders). You can use hyperfocal focusing very effectively though. Once you set up your lens properly, everything in excess of a calculated distance to infinity will be in focus, eg: from 3m to infinity. You just have to point the camera in the direction and pull the trigger. The wider the lens, the closer the focus distance minimum becomes. I just wish I had the temperament and courage to use it. There is more information here. The greatest thing about shooting with a rangefinder is knowing you are walking in the footsteps of some of the greatest. Robert Capa, Larry Burrows, and Henri Cartier-Bresson all used them. Knowing I have a similar camera in my hands never fails to inspire me. A bit like motorcyclists who nod at each other, there is a knowing between people who can recognise a rangefinder. I get asked engaged most often by randoms when I have a rangefinder out – other photographers who know. The shot of the couple kissing here demonstrates the potential outcomes using rangefinders for street photography. 21mm F4 Lens attached – the wide angle meant the camera was actually not pointing in their direction, despite capturing them in the frame. I was less than a metre away from them – the camera shutter is virtually silent and did not alert them. Although I suspect it would have taken a fair bit to interrupt their “moment”. I used a patient “camping” technique to get the shot. I just stood on the corner of Elizabeth and Flinders Streets and waited for people to come into frame. The corner is very busy, with lots of people pusing through. I stood behind a telegraph pole so that I would not be “moved along” by the crowds, and just waited for image opportunities to present themselves.